Downtown Frederick is an amazing outdoor gallery of diverse and exquisite artwork. Let this walking tour be your guide. Ingenious in concept and masterful in execution, Frederick’s public art sheds light on the city’s history, as well as the personal dreams and ambitions of its citizens. Here, lifelike trompe l’oeil (French for “fool the eye”) murals reside on the sides of historic buildings waiting to be discovered. An enchanted iron bridge takes on a magical life with beautifully sculpted dragonflies, cattails, flowering vines, and other natural elements. Use the interactive map below to follow the trail and learn more about each piece as you go. 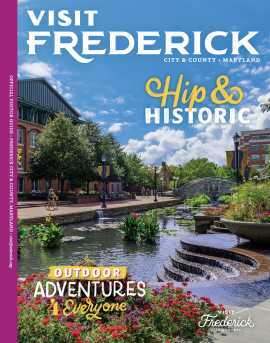 You can also pick up a physical brochure and map at the Frederick Visitor Center. This tour is intended to provide a sampling of the wide variety of public art in Downtown Frederick. For a comprehensive list of Frederick&apos;s public art, check out our public art page.